People are turning to the internet and mainly to Google to try and find services and products. This includes architects services. 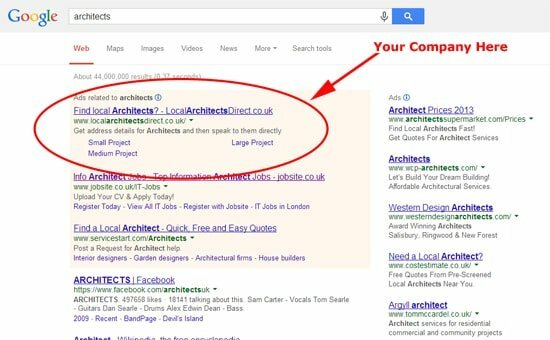 Each month there are 135,000 searches on Google for the phrase ‘architect’ and also 40,500 for the phrase ‘architects’. The image below shows a tool that Google provides us with so that we are able to research what people are searching for. As you can see the figures are encouraging; people are looking for architects and with our help they will be able to find you! An amazing 5,922,000,000 searches are made on Google every day. This accounts for 84% of the UK market in relation to internet searches. People who require architects will do their research online and then take action either by calling or emailing you. It is important to ensure that you are found on Google as high up as possible to gauge their interest. The image below shows where on Google your architect firm could be placed with our help. People who need accountants will do their research online and then take action by emailing or calling you. Let us make sure they find you. Trafiki have partnered up with Google and are giving away £150 worth of free Google AdWords vouchers to any new client. Let us help you find new business at a price you can afford. Call us today or email for more details on our Architect Offer.